Ok, moving on…lol! A few weeks ago, I started watching videos about finance and investing. The many blog posts I read about investments, insurances, and finances have challenged me to start learning about them. I am 28 years old now, I should have learned earlier but back then, I settled on the fact that we are poor and can never really invest. I was wrong. 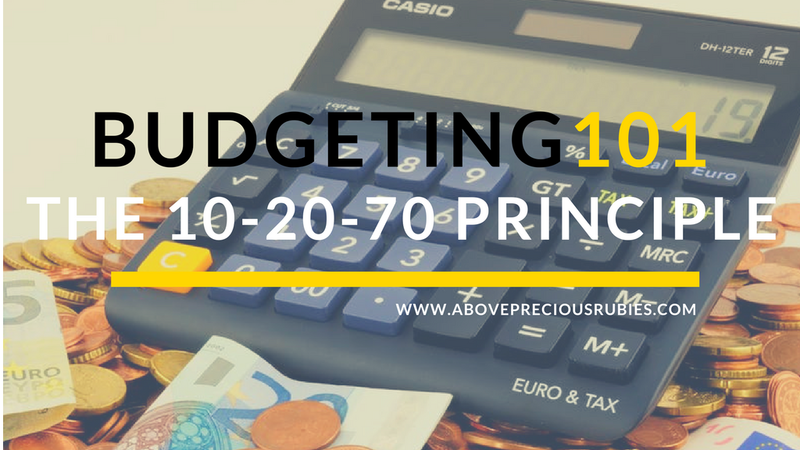 On one of the videos of Bo Sanchez, he talked about the 10-20-70 principle of budgeting. I’m glad I am on the right track because I have been doing it already, I just didn’t know there’s a term for that. lol! But in all honestly, we were not diligent in doing it. On the posts and financial videos I read and watched, I noticed that some have even more detailed budgeting than this. Some would change that also, depending on their needs. As for Dane and I, this is what we try to follow now, and more savings as much as possible. My mother taught me to tithe ever since I was a child so I take that with me everywhere I go. Before Dane left for Saudi, they had a seminar where they were taught about the I-S-EX principle. Medyo bastos sya sabihin pero, it’s INCOME minus SAVINGS equals EXPENSES, hehe. For so many years, we never had savings. Or kung meron man, nagagamit lang din at ‘di talaga naiinvest or lumalago. Nawawala lang din sya as time went by. Either nagamit for emegency or kaya nagastos sa ibang bagay. Ngayon lang kami nagkaron ng opportunity na makapag ipon talaga, pero I can’t say na malaki na ang naiipon namin, sobrang liit lang compared sa iba na magaling magsave ng pera. Does this principle work for us? Yes, both 10-20-70 principle ang I-S-EX work for us. Kasi, kung ano lang talaga ang matitira, yun nalang talaga ang pagtatiyagaan mong gastusin. I hope Dane and I will be consistent at doing this. Is it easy to follow, definitely not! And I can’t say we’re doing great at this yet ‘coz we’re just starting. Consistency is one of the hardest parts in following this principle. Thankfully now, we’re starting to save little by little. We’re also planning to invest in the near future but I don’t want to do it just yet. Right now, I just want to be able to learn more about finances and investments. Ayoko sana pumasok sa isang bagay na hindi ko masyadong naiiintindihan. So more on learning for us first, for now. 🙂 I remember during the Q&A portion nung seminar namin about money matters, medyo nangangapa talaga ako sa terms nila and all, lol! I’m 28 and just starting to know about them. I’m a bit late kung tutuusin, especially compared to others, but better late than never, right? This is really how things should be when it comes to budgeting. We try as much as possible to follow this but most of the time it's just so hard especially when the income isn't even enough. I think for now, we will focus on growing our income first. Grabe talaga ang mga gastusin, no? hirap! hehe. Aw, I'm happy to hear that! hehe. Sana tuloy tuloy na 'tong sa'min. 🙁 And I agree, sobrang hirap sundin ng % lalo pag may mga emergency. Thanks for sharing! Will check this out. I also learned about the jar principle from Miriam Quiambao. I haven't tried that yet, I'm not sure kung magwowork sakin kasi natetempt ako pag nakikita ko. lol. I'm using ung tinatawag nilang envelop system. Ay, gusto ko 'yang motto mo, lagi kong aalalahanin yan! "maging mayaman" NOT "magmukhang mayaman" haha. I used to do that when I was working before. Now that I have no money to Budget, I leave that to my husband as he prefers to do all the saving, paying of bills etc. With the little money I earn from writing, most of them are put in a savings account and I haven't withdraw anything pa. I think there's nothing to buy naman. As for the donation and church, husband is generous and kind enough naman to share his blessings.